Attaching to any Weaver style base, Browning's Buck Mark Reflex Sight is a prime choice for your Buck Mark or other pistol, offering 4 reticle patterns with a simple twist and utilizing state of the art technology for maximum accuracy. 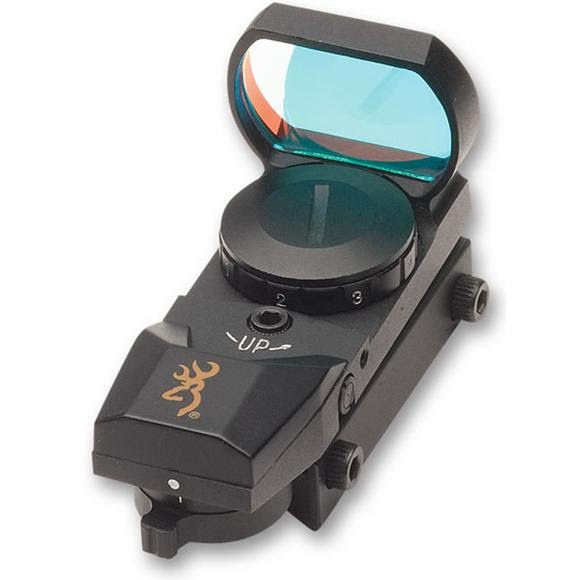 Attaching to any Weaver style base, Browning&apos;s Buck Mark Reflex Sight is a prime choice for your Buck Mark or other pistol, offering 4 reticle patterns with a simple twist and utilizing state of the art technology for maximum accuracy. Four reticle patterns: Circle-Dot-Cross Reticle, 3 MOA Dot Reticle, Cross-Dot Reticle, Circle-Dot Reticle. Field-of view:15.7m/100m, unlimited eye relief. Powered by one #2032 lithium battery. Mounts to a standard Weaver-style base. Rugged aluminum housing with matte black finish.